Gigabyte X99 Gaming G1 WIFI Motherboard Revealed - Looking Good Gigabyte! 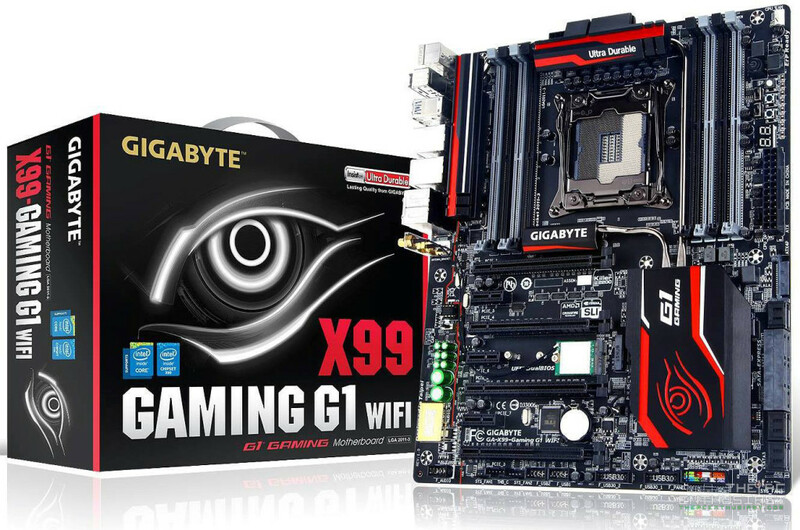 Gigabyte X99 Gaming G1 WIFI Motherboard Revealed – Looking Good Gigabyte! As you might have known already, the next generation Intel X99 platform is due next month, September. One by one we see motherboard manufacturers tease us with their upcoming X99 high end desktop motherboards. Today, Gigabyte revealed their upcoming Gigabyte X99 Gaming G1 WIFI featuring a definitely better looking chipset heatsink design (that’s actually the first thing I noticed) and a familiar layout with the Z97X Gaming G1. Check out some of the X99 Gaming G1 WIFI’s features below. Looking at the Gigabyte X99 Gaming G1 WIFI it somehow looks like an upgraded version of the Z97X Gaming G1 WIFI-BK motherboard, but comes with a much better chipset heatsink design (in my own opinion). I just hope they added some LED light effects on those heatsink to give it a more premium feel. Let’s talk about the upper portion of the motherboard first. The Gigabyte X99 Gaming G1 WIFI features an LGA 2011-3 socket that will support the upcoming Intel Haswell-E processors like the Intel Core i7-5960X, Core i7-5930K and Core i7-5820K. Like all X99 motherboards, it has a total of 8x DDR4 DIMM slots supporting quad channel memory. Expect that DDR4 will be much faster than DDR3 since starting speed is 2133MT/s, and it will not be backwards compatible with DDR3 memory. It features an 8 phase power design and draws its power from an 8 pin power connector. We can also see the 24pin motherboard power connector on the usual spot, and onboard power button is present as well. There are several switches and smaller buttons, voltage points, as well as the debug LED near the DDR4 DIMM slot. Also based on visual observation, I am guessing that the Gigabyte X99 Gaming G1 WIFI will feature the same G1 Audio with AMP-UP Audio Technology, high end Nichicon audio capacitors, Creative Sound Core3D Quad Core audio processor and the LED path that separates the audio components with other components of the motherboard. Expect that audio quality on this motherboard would be fantastic as well. It features Killer E2200 LAN, but it may also feature an Intel Gigabit LAN as well, just like the Z97X Gaming G1. The X99 Gaming G1 sports 4x PCIE 3.0 x16 slots and three PCIE x1 slots. It also supports both AMD CrossFireX and NVIDIA SLI multi-GPU configuration. There’s also an M.2 and WiFi slot between the 2nd and 3rd PCIE x16 slots. On the storage department, it features a total of 8x SATA III 6 Gbps ports and 1x SATA Express port, or 10x SATA III ports when the SATA Express port is not in use. There also an onboard SATA power connector for additional power when you plan to install multiple graphics card. Basically that’s it for now. Hopefully Gigabyte will tease us more next week with more shots of the Gigabyte X99 Gaming G1 WIFI and hopefully they will start to reveal some of its features. Again, the X99 motherboards, together with the Intel Haswell-E processors and DDR4 memory are expected to become available by next month, September 2014. I’m also expecting that this is not their highest end X99 motherboard, and Gigabyte might release an X99 Black Edition, and an X99 Overclocking series as well. Tell me what you think about Gigabyte’s upcoming X99 motherboard. What are the things that you like and dislike about it, and what are the things that you are expecting to see in this motherboard. Hit the comment section below, and don’t forget to share this article with your friends. See also Gigabyte’s other latest X99 motherboards: the Gigabyte X99 SOC Force for the overclocking enthusiasts and the Gigabyte X99 UD7 WIFI Ultra Durable Motherboard. Galaxy GeForce GTX 750 Ti HOF Surfaced – Looks Like a High End Graphics Card!